Whether you are on birth control or you find it impossible to be pregnant; you still find yourself asking, why is my period late? Being a woman is hard enough already. 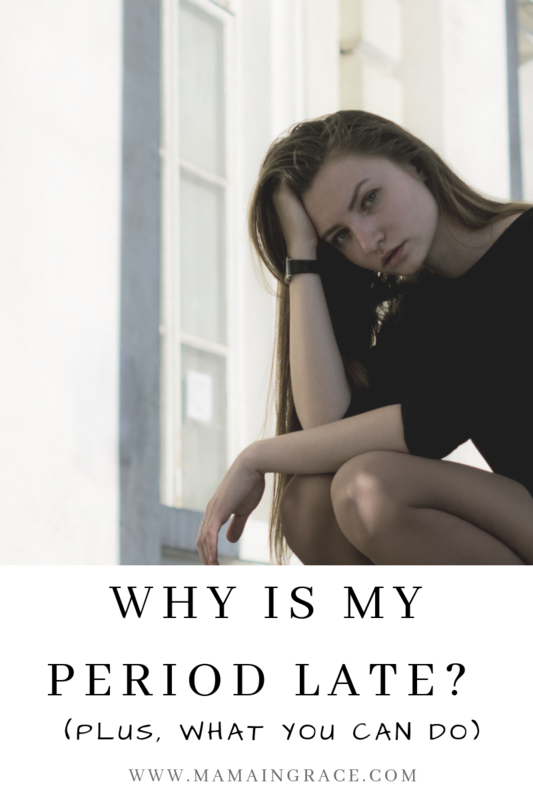 We get to deal with massive amounts of hormones on a daily basis and to top it off we have the constant stress of our period. Being that our bodies rely so much on our mind, our periods can be heavily effected by our mental health. This past month has been really stressful for me. Not only do we need to fill our books now that its spring time, but the stress of having three kids is getting harder and harder. Ethan is just what our family needed, but boy is he a busy 1 year old! I finally just got over my monthly cycle, but i was almost two weeks late. Just because my husband has a vasectomy, that doesn’t mean that it doesn’t happen! I know those personally who have gotten their wives pregnant after having a vasectomy.. its scary. But it happens! So just like before, i still stress when i am late on my period. The stress in our lives is constant for many reasons. But, talking about our period is just barely scratching the surface. In all honesty, i don’t know many women who don’t keep track of their period. Whether you are trying to have a baby or not trying to have a baby, our period is on our mind– a lot. On top of many, many other things. Imagine a hamster on a wheel… yep, that is the constant state of my brain. Over the years of stressing every month i have learned to go through a simple checklist in my mind before i really freak out. I like to think of the things that could be effecting my period being late. Especially because that period of waiting before you can even take a pregnancy test can be unbearable to the mind. Or maybe you already took a pregnancy test, it was negative, and now you are desperate for a different answer. Going to the doctor for answers like this isn’t always the easiest thing for us, and not all of us really want to. I totally get it. Knowing the exact week of my last period and giving myself a 4-7 day grace period. I always like to give myself a good week before i really start to stress out. Sometimes our bodies are just a little behind and need some time to catch up with themselves. Even if your period has always been consistently the same, its important to remember that our bodies change so much all of the time. That is why its so important to understand yourself the best that you can and to give yourself that grace period. Considering if i have been sick or if anyone else in my house has been sick. I have noticed that when my body is trying to fight an infection of any sort, it has totally thrown off my period before. So, this is something i always take into consideration now. Having a weak immune system and a chronic illness are other key factors in your period being late. Thank the good lord for how our bodies were made because in our favor, our bodies heal in order of importance. With that being said, any kind or chronic condition or illness can cause our bodies to take months to get back into a menstrual cycle routine. Thinking about my diet and the foods that i have been eating. I’ve noticed that the foods i eat heavily effect my physical health. Its really no lie when you say that you are what you eat. The foods that we eat really do effect how we feel physically which then effects how we feel mentally. The fact is that the food that we eat plays a major role in our overall health, and as women, even our period. Taking into consideration how active i have really been. Even though i would love to say that i stay on top of my work out game, i don’t. I try, i really do. But, some of us just have that kinda life and that is OK. We have to give ourselves credit where credit is due; and sometimes that credit is in a completely different area of our life. But, that also means that we can be late on our period. Being inactive or inconsistent with being active can really take a toll on our body and the hormones we produce. That is another reason why (among thousands) being physically active is so dang important. Supplements and/or medications; birth control. Birth control is always a given for changing menstrual cycles. Depending on the birth control method that you use, it could be stopping ovulation all together. Which would make complete sense as to why those taking birth control can have a late period; and sometimes none at all. Prescription medications also have a common side effect that can throw off the hormones in your body. Check the medications you are taking and see if that could also be a reason for your period being late. Some natural supplements can throw your hormones off as well which can also cause a late period. Especially if you are just introducing something new to your body. If so, have patience for your body to level out and give yourself a couple of weeks before stressing too much about it. This can also go along with hormone changes, because we all know how much breastfeeding can effect our hormones. Sometimes it feels as if were still pregnant when we are breastfeeding. Even after 6 months! All three times i breastfed my babies, i didn’t have a period at all. There were some weeks that i would spot and feel extra moody, but never did i have a full blown period. That doesn’t mean though, that you wont. Some women do still have their period when they are breastfeeding, but just know that it can be the reason why your period is late. Hormones play such a vital role in our overall health and also can really effect our weight. When our weight is fluctuated so much, this can be grounds for having an irregular period. If you have checked all other things off the list and you feel like something is really wrong, you need to demand that you get an answer. I am a firm believer in self advocacy and when you know something is wrong, you know. If you are not in the stage of pre-menopause; And if you have any signs of hormonal imbalances such as PCOS ( Poly-cystic Ovarian Syndrome), or Thyroid Disorders you can request a blood test from your doctor to rule those things out. The most obvious and sometimes overlooked reason for your period being late is stress and anxiety. Like i said before, life is already full of things that stress us out and throw our bodies into wack mode. When our bodies aren’t at peace physically, spiritually, and emotionally–things can get cray cray. If none of these other reasons seem probable to you, maybe what you need is to take care of yourself better. Not just a bath, or a quick run. Like really, really, take care of yourself. Write in a journal, talk to someone you trust to vent to (if that’s what helps you), and just do what you can to get your mindset in the right place. When we take care of our mental health, it makes taking care of our physical health so much easier. And when we are doing both of those things, life gets a lot better. Important reminder: Just like with everything else within us, there is no “normal” when comparing yourself to someone else. We are all made differently and our bodies have all learned different techniques to survive in the state its been in. Not having a period like someone else’s is completely normal, its all about just figuring out whats normal for your own body. Our bodies change all the time and a normal cycle can last anywhere from 2-7 days. Check out some great information from the Mayo Clinic that explains this perfectly. Personally, i really encourage you to do your own research as best as you can so you can fully understand what is going on with your body. I definitely wouldn’t be where i am with my health if it weren’t for me advocating for myself and knowing when something is wrong. I’ve gotten so much further with healing my body by doing my own research. In addition, you can work along with your doctor and express to him what you want to rule out. You have every right to do that. PS: Chocolate makes everything better, especially during these times 🙂 Here are some things i thought might make you laugh or at least smile, since this subject can be a bit.. unfriendly.